This 3-day Autodesk authorized 3DS Max training class is designed to provide 3ds Max users with an understanding of core 3ds Max functionality and features so that they can create, edit, and organize 3ds Max projects. While appropriate for all users, the projects used are geared towards real-world tasks encountered by users of 3ds Max in the architecture, interior design, and civil engineering industries. The class provides a thorough introduction to using Autodesk 3ds Max and helps both new users and self-taught users make the most of this sophisticated 3d design application. Schedule of upcoming 3ds Max training classes. This 3ds Max class will provide you with the skills need for creating photo-realistic still renderings and desktop animations. 3DS Max includes its own tools for 2D and 3D modeling which you will learn to use in this class. You will also learn to work with geometry imported from many other applications. Attending the class will make you comfortable with the 3DS Max user interface, basic modeling and animation, using materials and mapping, and rendering stills and basic animations. After each topic is introduced, students complete a hands-on practice that reinforces the topic or skill that was just presented. The topics and practices generally follow a building-block approach, where each succeeding practice reinforces earlier topics. The instructor works individually with students to answer any questions and ensure that they all are able to understand and complete the practices. Attending this class will provide a solid grounding in 3ds Max so that you can immediately be productive. 3ds Max is also used throughout the production cycle in film, video game, and television development. While this class is a useful starting point for novice users in these industries, advanced topics (such as character modeling, character animation, and rigging) are not typically covered in this class, although the instructor may adapt some topics to the skills of those participating. This class starts at the beginning and teach the fundamentals so it is appropriate for novice users. No previous 3d experience is necessary. That said, while extensive experience with 3DS Max or 3d software is not required, you’ll get the most out of this class if you have begun to experiment with the software at least a little bit. Previous exposure and use of AutoCAD or other 2D drafting programs is helpful. Participants should have access to 3DS Max at home or at work. Students and educators can download 3ds Max for free. 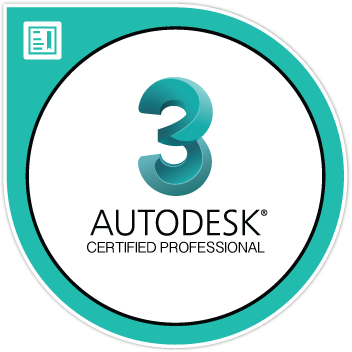 The 3ds Max Certified Professional credential validates professional users’ knowledge of the tools, features, and common tasks of 3ds Max. Earners of this designation have demonstrated knowledge of rendering, object and data management, advanced modeling, and more using 3ds Max. Advanced topics, such as sophisticated character modeling, animation, and rigging are not typically covered in this fundamentals class, although the instructor may adapt some topics to the skills of those participating.